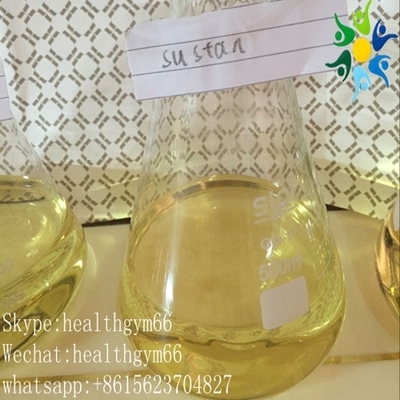 Sustanon 250 mixed 250mg / ml Injectable Anabolic Steroids , Injectable Testosterone Steroids - HealthclubBiotechnologyCo.,Ltd. Health club Biotechnology Co., Ltd.
Main ingredients: Testosterone Propionate, Testosterone Phenylpropionate, Testosterone isocaproate, Sustanon is a fairly popular anabolic steroid product among bodybuilders and athletes for muscle building purposes as well as other reasons such as andropause. At a level of 250 mg / week, Sustanon essentially provided only a high level of testosterone replacement therapy. Individuals with low testosterone can see significant improvements, but many people with moderate or high natural testosterone do not see an increase in the dose level. However, Sustanon inhibits the hypothalamus and pituitary at this dose, and will significantly shut down natural testosterone production when used. Thus, the dose has a relatively small benefit of most steroid cycles, but has adverse side effects that inhibit testosterone production. 500 mg / week is the lowest dose level, most see good results. At this dose, the gain is usually good for the first cycle and generally does not require adjuvant drugs to control estrogen. But in many cases, estrogen control is already desirable. The next step at 750 mg / week provides a significant further increase, and if the control of estrogen, the side effects are usually not significantly different from 500 mg / week. A dose of 1000 mg / week is usually sufficient for intermediate or even many advanced users. In some cases even more than this. However, this is usually unnecessary, unless the result has reached 1g / week level has reached the platform.